Idol group MBLAQ made a comeback with their new song, ”This is War“, a powerful and dark piece that resonates with themes of betrayal and hostile anger. 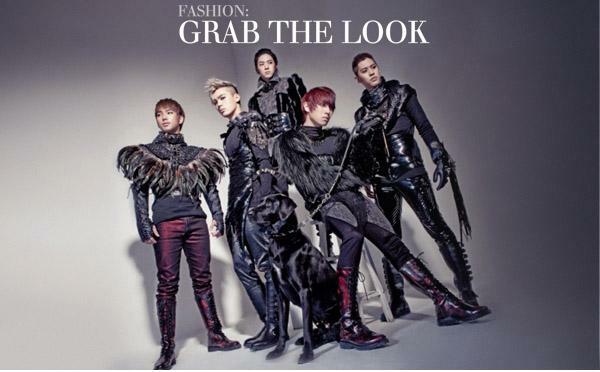 To reflect that, MBLAQ’s stage costumes are equally dark and aggressive, utilizing a hint of military inspiration. The key to wearing an all-over dark outfit is mixing textures or tonal patterns to give the look depth and interest. Keeping a sharp eye on proportion is also important in creating a flattering effect; you want to avoid losing your figure by wearing pieces that are too big or swathe your silhouette entirely. A loose destroyed top with metallic accents paired with subtly printed skinny jeans is a great way to keep proportion in check. A killer jacket with lots of personality is the key item for this look and will turn jealous heads. Add a strong pair of shoes with buckles, studs, leather, or tonal print to supply ‘edginess’ to the outfit. Finish with some metallic armor-inspired accessories to tie everything together!